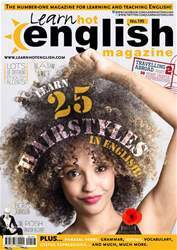 Hi, and welcome to another issue of Learn Hot English – the fun magazine for learning English. 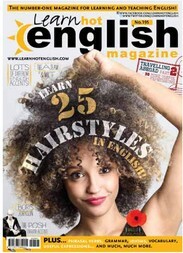 In this month’s issue, you will learn about 25 hairstyles and how to name them in English. We’ve got just about everything from the bob, the Mohawk and the bun! This month is also the second part of our useful expressions for travelling abroad. Learn 30 more really useful phrases to help you survive just about every travel situation!